Sandy: I'm not sure about God, but I am now quite sure about witches. 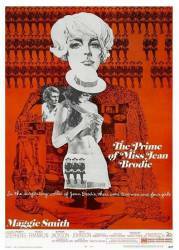 Jean Brodie: Little girls! I am in the business of putting old heads on young shoulders, and all my pupils are the creme de la creme. Give me a girl at an impressionable age and she is mine for life. You girls are my vocation. If I were to receive a proposal of marriage tomorrow from the Lord Lyon, King of Arms, I would decline it. I am dedicated to you in my prime. And my summer in Italy has convinced me that I am truly in my prime. Gordon Lowther: I do not want to be your lover! I want to be your husband.